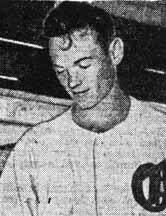 Lefty Lloyd Hittle, 21, hails from Lodi, California. Pitched for the Stockton Ports in 1947 to lead the league with an E.R.A. of only 2.24. Did a splendid pitching job with 20 wins against 6 losses. Throws from the port side, but bats right. First came to the Oaks in 1948, but was sold to the Washington Senators in May of 1950. After two losing seasons with the Senators, he returned to Oakland in 1951. 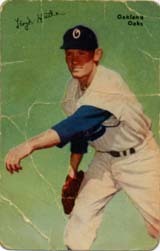 The southpaw hurled the next two seasons for the Oaks, until he was traded to the Hollywood Stars in 1953. Return to The Oakland Oaks webpage.